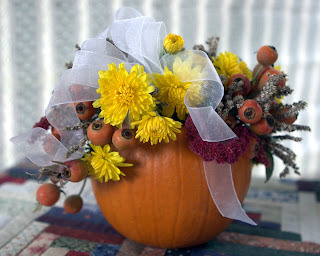 Karleen and I spent a day together recently when we made pumpkin bouquets. I've shared the arrangements we made in a previous year, but I thought you might enjoy seeing this year's bouquets. As usual, we started by raiding our flower gardens of any flowers we could find. It's getting late in the season, but we found asters, mums, baby roses, and lavender. We also added amaranth seed stems and rose hips this year. Instead of the tiny decorative pumpkins, we decided use the larger sugar pumpkins that are generally used for pumpkin pies. Clippers, a drill, and some florist picks were added to our supply table. While we were creating, Karleen got side-tracked by another project (which I will share another day), but we had a wonderful time chatting, creating, and sharing together. Doing a project with a friend makes it so much more fun! Our first arrangement is the one shown at the top of this post. It consisted mostly of mums, rose hips, and dried seeds from plants in the yard. We added a sheer ribbon for accent. Some of the stems were difficult to get into the pumpkin, even with drilling, so we added floral picks and then were able to apply greater pressure with a pair of pliers. 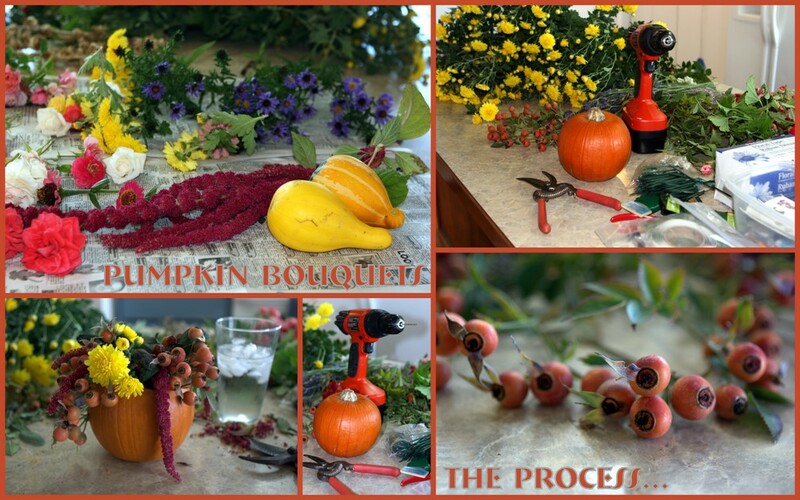 Tools are so practical for flower arranging! This arrangement went to Mrs. Flower Lady. She lives down the road from Karleen and it was her eighty-second birthday. We decided to try something different for the second bouquet. This time we cut the top off the pumpkin and hollowed out all the seeds. A small piece of Oasis (floral foam that soaks up water) was cut to fit inside. After a good soaking we put it in the pumpkin and started arranging. Stems from a boxwood shrub created a triangle-shaped framework. Then we added large stems of rose hips and clusters of mums. Accent was provided with asters and baby roses. The crowning piece to this arrangement was the addition of swags of amaranth. They took the arrangement from traditional to just a bit quirky! How fun! All in all, a good time was had by all --- and I am already looking forward to NEXT autumn so we can do it again! If you want a closer look at the collage or any of the other pictures, just click on them to enlarge. 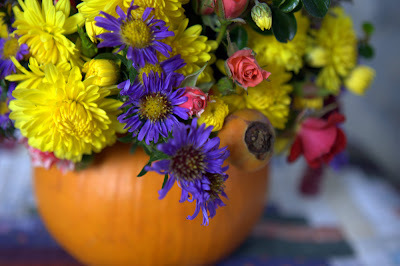 Your Fall arrangements are gorgeous - and I love that you used what you found in the yard.